Dramatic footage shot from the International Space Station show the vast spread of Hurricane Irma. The massive storm is barreling toward Haiti on Thursday (Sept 7) after leaving a trail of destruction in the Caribbean. MIAMI • Hurricane Irma’s deadly fury hit the low-lying islands of the Bahamas yesterday as the monster storm moved towards Florida’s doorstep, packing the potential to ravage the US state with destruction not seen in a generation. With Irma expected to reach the American south by the weekend, coastal areas in south-eastern United States were battening down the hatches and carrying out their biggest evacuation since 2005. Up to a million people have been told to flee. Florida Governor Rick Scott warned the state’s 20 million inhabitants that they should all be prepared to evacuate as the storm “is wider than our entire state”. President Donald Trump warned of Irma’s destructive potential, saying it was a a storm of “absolutely historic destructive potential”. The hurricane was downgraded from Category 5 to Category 4 early yesterday, but still packed winds as strong as 240kmh, the National Hurricane Centre (NHC) said. Irma lashed the Caribbean with devastating winds and torrential rain, killing 19 people and leaving in its wake a swathe of catastrophic destruction. Prime Minister Gaston Browne of Antigua and Barbuda, grasping for a word to describe the devastation, said it was now “rubble”. France’s Minister for Overseas Territories Annick Girardin described “scenes of pillaging” on Saint Martin, as looters cleaned out stores and roamed the streets in search of food and water. But even as they were picking up the pieces, stunned locals were getting ready for another major hurricane, Jose, due to reach the north-eastern Caribbean today. The storm strengthened to Category 4 yesterday. 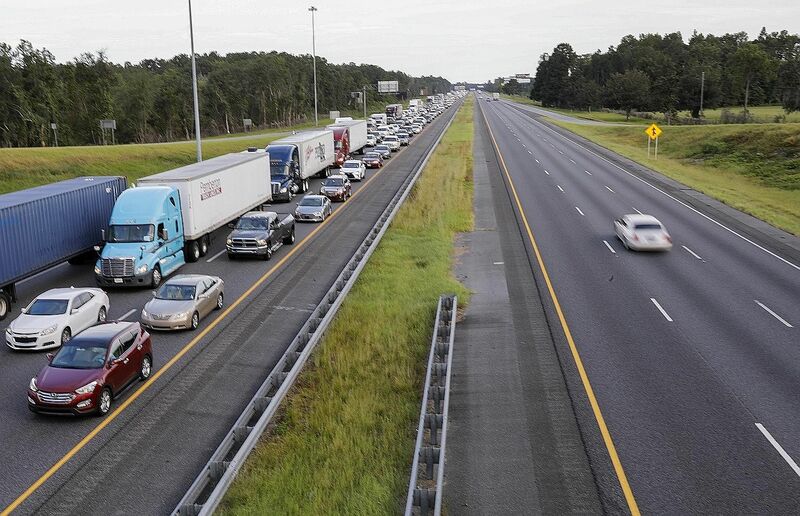 In Florida, the rush to leave had millions of people on the move. Highways were jammed, petrol was scarce, airports were packed and mandatory evacuations started as the first official hurricane watches were issued for the region, which could face destruction not seen since Hurricane Andrew in 1992. State of emergency was also declared in Georgia, South Carolina and North Carolina in anticipation of Irma’s path. Still, it was unclear where Irma will make landfall. “The wild card here is the turn. Any time a hurricane makes a turn, it introduces uncertainty,” Dr Mark DeMaria, acting deputy director of the NHC in Miami, told The Washington Post in the NHC headquarters in west Miami-Dade County. He noted that the computer models have fluctuated modestly, with adjustments in the consensus track of 80km or so every day. “But 80km onshore versus right of the coast makes a huge difference in impact,” he said. The combination of Florida‘s geography, pattern of urban settlement in narrow bands along the coast and the projected northerly path of the hurricane presents a particularly ominous picture. Irma is the strongest hurricane recorded in the Atlantic Ocean and one of the five most forceful storms to hit the Atlantic basin in 82 years, said the NHC. The storm comes two weeks after Hurricane Harvey hit Texas, claiming about 60 lives. The House of Representatives yesterday overwhelmingly approved a US$15.25 billion (S$20.4 billion) disaster aid package despite strong objections from conservatives, who opposed including an agreement struck by Mr Trump and congressional Democrats to raise the federal borrowing limit and keep the government open until Dec 8.